Bring your marketing & sales team together, improve your lead gen & nurturing, and ultimately close more deals. You can do it all with this tip. "Marketing departments don’t get it: they don’t understand the customer; they don’t understand the challenges salespeople face; they don’t understand how to turn a lead into a prospect, then a customer, then a long-term customer…"
"Sales departments don’t get it: they don’t understand the need to shift from push to pull marketing; they don’t understand how the buyer’s journey has forever changed; they don’t understand that content marketing is far more effective – and cost efficient – than traditional advertising…"
Such disconnect has existed for as long as marketing and sales departments have existed. So how do you bridge the gap to generate more leads and, ultimately, more sales for your business? Easy. Get everyone together and start a conversation – but not just any conversation. One of the first things we do when we begin working with a new customer is sit down with the entire team: marketing, sales, leadership, sometimes even operations. Then we ask everyone for the questions they, in their roles, are most frequently asked. Basically, we create a huge list of FAQs. The primary reason for creating an extensive list of frequently asked questions is to flesh out and prioritize an editorial calendar for content marketing, but there’s a huge secondary benefit: suddenly everyone in the room begins to find themselves on the same page because everyone hears and discusses the same issues. In either of those cases – and all the cases in between – the conversation leads to a much better understanding of the customer and the market. Done correctly, the meeting might take a few hours, and that’s great because those conversations invariably lead to a much better relationship between the sales and marketing teams. The key is to get both sides talking not just about themselves and their needs but also about the customer and the customer’s needs; when you do, all the barriers and simmering resentment quickly fall away. 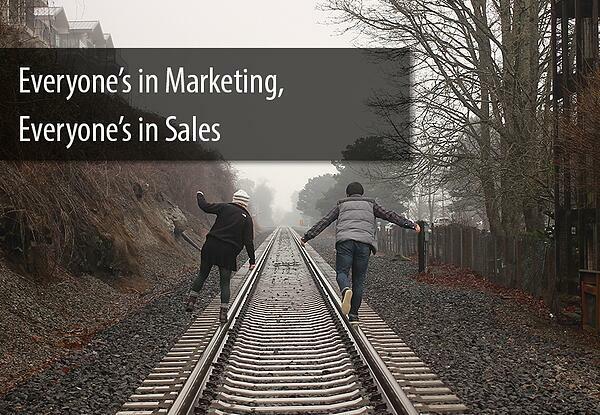 And within a few hours, salespeople remember and are reassured that marketing is truly trying to help them. The marketing team better understands the information they need to get from salespeople to produce the right content. And suddenly, buyer profiles become both clearer and more comprehensive – and therefore much more effective, since those personas can be loaded into marketing automation tools and can inform future marketing plans. Try it. Get your teams together and create a list of frequently asked questions. Let people talk. Let people share ideas. Let them find common ground. Let them begin to speak the same language. When they do, your marketing and sales teams will be much more effective and the business will benefit as a whole.